Like I mentioned in a previous blog post, the problem when it comes to travel posts is that I want to write about everything in chronological order but since travel posts entail a lot of work because of too many details and meticulous photo sorting, I end up not writing about my trip at all. This blog post is part of my US trip in 2014. The best thing about going to LA is seeing and catching up with family and friends. Well, thanks to iMessage, we all get to keep in touch regularly but there are still things you want to make kwento in person so I met up with my friend Tina for lunch. Tina was supposed to bring me to Din Tai Fung but when she saw on Facebook that I ate there just before I went to the States (read my blog post about Din Tai Fung in Hong Kong), she took me to Raffi's Place in Glendale instead. It is already after lunch but the place is still pretty packed. A lot of Persian and Middle Eastern nationals are dining there so I take it as a sign that the place serves good Mediterranean food. Upon ordering, our server gives us complimentary mint leaves, radishes, and onions. Then he places a white, creamy substance on our table. Apparently, it's Yogurt and Mousir ($6++) which is a combination of yogurt and grated shallots. This is good on meat and bread. He also gives us complimentary Naan which is leavened and oven-baked flat bread popular in Central Asia. This is Tina's daughter Yuna. Time really flies! I visited Tina when she just found out she was pregnant with Yuna, then we went to Vegas when Yuna was just a toddler (read my blog posts about our trip to Las Vegas), and now she's a not-so-little girl anymore. Super cute and daldal! Tina goes to Raffi's regularly so I let her order what she wants me to try. She orders the Soltani Kobab ($21+SC) which has filet mignon and ground beef skewered and charbroiled to perfection. She also gets Chicken Boneless Kebob ($16+SC) or boneless chicken thigh mixed in but I don't know if this is included in the Soltani platter or is a separate order. 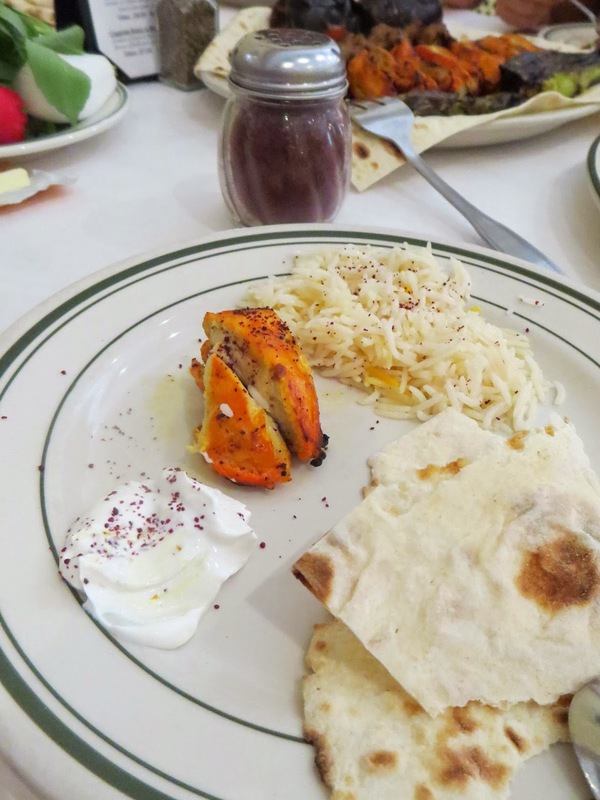 The platter comes with grilled tomato, Anaheim pepper and Naan. All entrees are served with fluffy Basmati rice. The best way to eat the rice is to mix it with butter. Tina told me to use this spice called Somagh all over my food. It's not really spicy but it adds flavor to everything. And just when I thought we don't have any space left, Tina orders Armenian Coffee ($3+SC) and Spumoni ($5+SC) which is layered pistachio, chocolate gelato, and strawberry sorbet served with raspberry syrup. Both the coffee and the dessert are so good! It is so nice seeing you Tina and Yuna! Thanks for taking me out for lunch. Good Persian and Middle Eastern food. 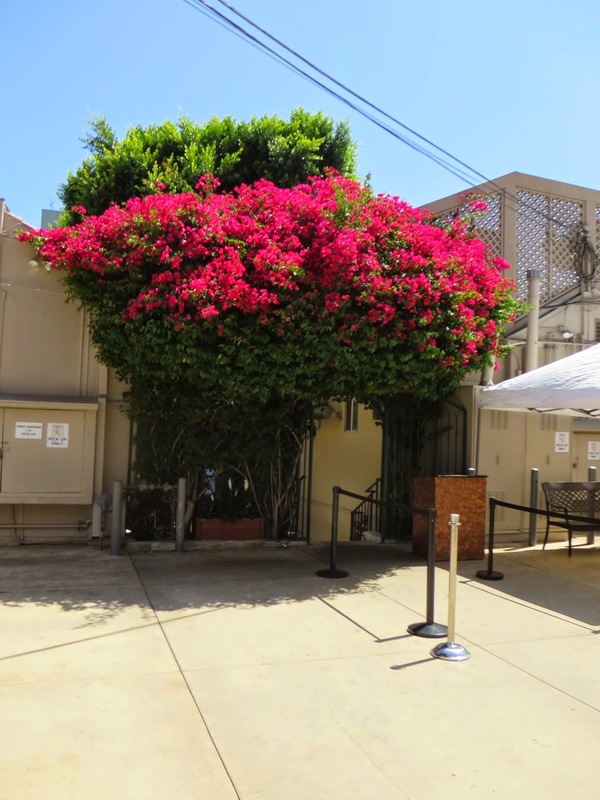 Raffi's Place serves good and authentic Mediterranean food proven by the number of Persian and Middle Eastern nationals who frequently dine there. Joei!! You know Raffi's better than I do and I've been a regular customer for more than 10 years now. I hope they find this and give me free food. Hahaha! More food adventures for us soon! Either here in the US or in Manila. We miss you so very much! !